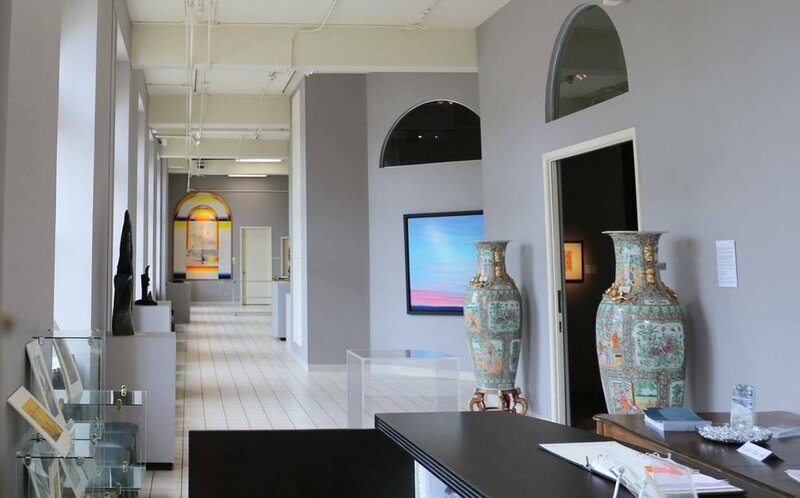 The Michelson Museum of Art was established after Janine Michelson of New York City and Paris, France, widow of artist Leo Michelson, selected Marshall, Texas, as the permanent home for her husband’s work. Her consideration of Marshall was suggested by Wendy Russell Reves, a Marshall native and friend of the Michelsons. In January 1985, a group of dedicated Marshallites visited Mrs. Michelson in New York and accepted her gift of the collection, consisting of more than 1,000 works of art created by Mr. Michelson. After fundraising and finding a suitable temporary location, the museum opened in May 1985. In April 1990, the museum moved to its present location on the first floor of the Southwestern Bell Telephone Building in downtown Marshall. A local architectural firm adapted the space that now includes three exhibit galleries, an 80-person auditorium, classroom, family Discovery Room, offices, kitchen, and work areas with both permanent and temporary storage. The museum has a total of 12,000 square feet with 750-850 linear feet in gallery exhibition areas and is completely wheelchair accessible. In 2000, the Kronenberg Collection became a part of the museum’s permanent collection. The 100 pieces of art, collected by Dr. Bernard Kronenberg of New Rochelle, New York, were created by early 20th-century immigrant artists, including Milton Avery, Abraham Walkowitz, Georges Rouault, and Henri Matisse. Dr. Kronenberg’s widow has donated additional pieces to the museum in the ensuing years. In 2001, Ramona Ward of Los Angeles donated a collection of 64 antique African masks and artifacts dated to the mid-1800’s, and in 2005, Mrs. Ward donated her collection of antique Chinese puppets to the museum. Mrs. Ward is the widow of Jay Ward, creator of the cartoons Rocky and Bullwinkle, George of the Jungle, and Dudley-Do-Right. The mission of the Michelson Museum of Art is to brings art and people together for enjoyment, discovery, and education. We strive to create a place where people of every background can be touched by art. We are committed to exhibitions and programs that will strengthen and sustain our community. The purpose of the Michelson is to conserve, collect, exhibit, and encourage the appreciation of and participation in the visual arts through a broad range of exhibitions and educational programs. The Michelson maintains memberships in the Texas Association of Museums and the American Alliance of Museum. For programs and classes, the museum underwrites published authors, professional performers, and licensed teachers. We maintain awareness of schools’ curricula, security of young children, and demands of technology. In addition, the Michelson also houses a large collection of art reference books available to the public.